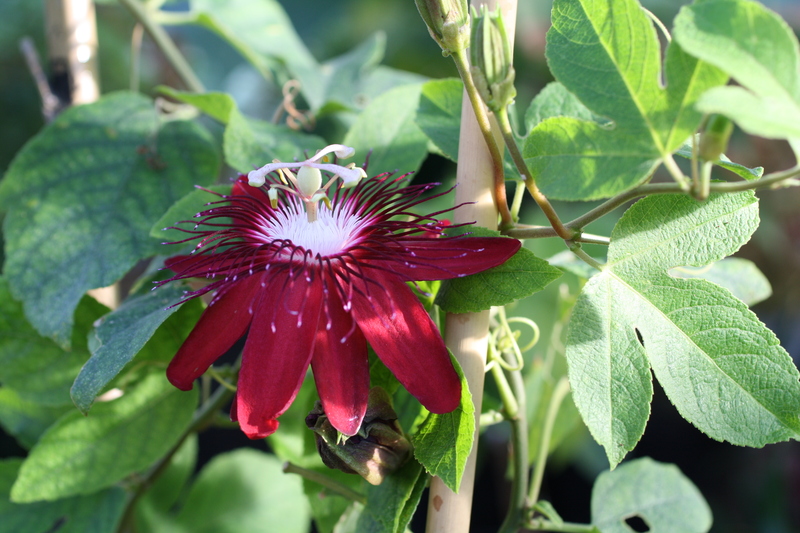 The ‘Lady Margaret’ Passionflower blooming now is a gorgeous deep red with a white center. Passionflowers are an interesting combination of delicate petals and filaments topped by the very architectural structure of the stamens. Or, as the Missouri Botanical Garden website says, “The hallmark of the family is the corona… filaments that extend outward like a cup. The corona…carries perfume, holds in nectar, acts as a landing platform for pollinators, and is a visual attractant. 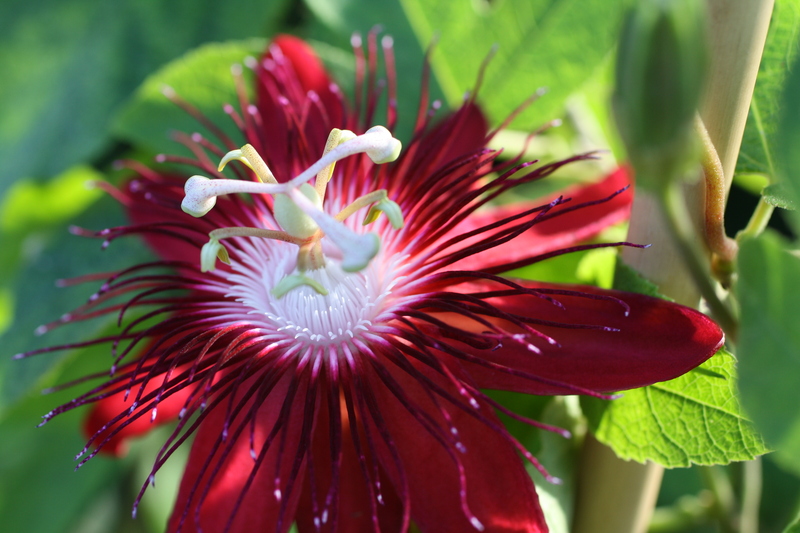 In Passiflora, the stamens are borne beneath the ovary on an elevated column”. Passiflora is a genus of about 500 species worldwide, mostly vines. There are nine species native to North America, with a few being much cold-hardier than you would think from their tropical appearance. P. incarnata, also known as Maypop, can be grown outdoors in zone 5. P. lutea and P. caerulea are also considered cold hardy enough to grow outdoors in southern Rhode Island. Lady Margaret was given to me by a plant person who knows her plants, and I’m sure it is a Lady Margaret. Unfortunately, I didn’t get the species or hybrid name, and a quick internet search came up with lots of possibilities: Passiflora vitifolia x P. caerulea﻿, Passiflora coccinea x P. incarnata, Passiflora caerulea ‘Constance Eliott’ x P. miniata, Passiflora incarnata x P. miniata, and Passiflora coccinea x P. caerulea. It will take a little more detective work to figure this one out ! I did look into the common name Passionflower, which doesn’t refer to the Valentine’s Day passion of love. Too bad, because I think they’re more interesting than red roses! The word passion is sometimes used to mean suffering, and 15th and 16th century Spanish Christian missionaries viewed the unique physical structures of this plant as symbols of the last days of Jesus and his crucifixion. 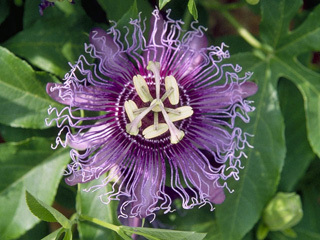 In different parts of the world, Passionflowers have reminded people of other things, such as clocks: it’s Clock-flower in Hebrew and Clock-plant in Japanese. 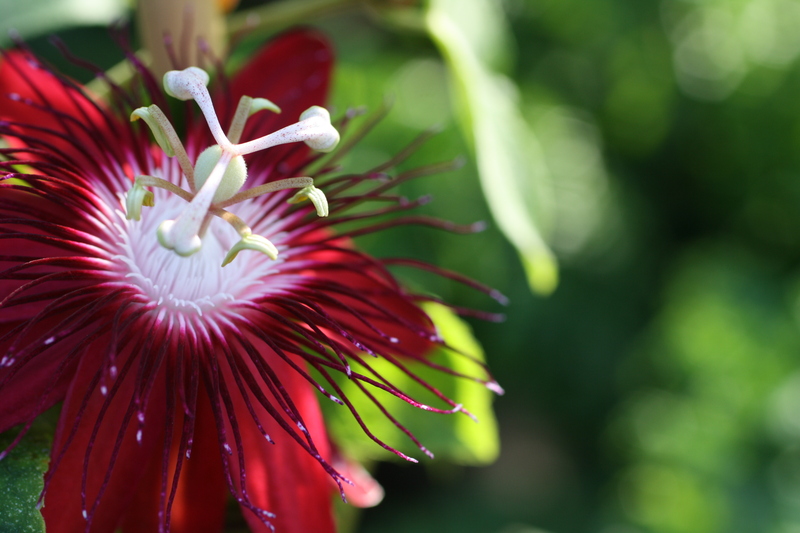 Passiflora incarnata (not my Lady Margaret) has been used as a medicinal plant for centuries. The University of Maryland Medical Center (www.umm.edu/altmed/articles/passionflower-000267.htm) says a tea of the flowers, leaves, and stems was used traditionally in the Americas and later in Europe as a “calming” herb for anxiety, insomnia, seizures, and hysteria. It is still used today to treat anxiety and insomnia. Passionflowers in their native habitats are an important source of food for a variety of creatures. Some are pollinated by hummingbirds, wasps, bumblebees, or bats looking for nectar. Larvae and caterpillars of a wide variety of butterflies feed on the leaves. Some Passifloras, such as P. edulis, are cultivated for their fruit by people of the Caribbean. Cuttings are the easiest way to propagate Passionflowers. Cuttings taken in the spring and kept close to 65 F will root readily in a 50/50 mix of peat and perlite. They’re not hard to grow, preferring well drained soil and full sun. The root systems are relatively small, so they can be grown indoors without the need for a huge pot. This entry was posted in Botanical Gardens, Conservatory, Greenhouse, Photography, Plants, Uncategorized and tagged cuttings, flowers, greenhouse, houseplants, medicinal plants, photography, vines on February 14, 2011 by uribg. Ahhh! 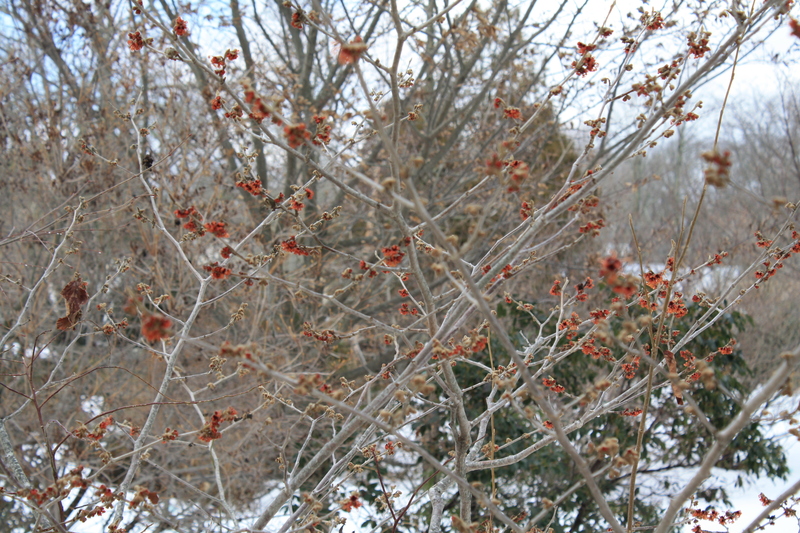 In spite of the snow/cold/rain/thaw the Witchhazel is flowering right on time. On Upper College Road, the cultivar ‘Jelena’ is beginning to open with red and orange flowers that always remind me of “blow-out” party favors. Over near the gazebo, ‘Arnold Promise’, from the Arnold Arboretum, has yellow flowers and a pleasing fresh light scent. The very tips of the yellow petals are just beginning to peek out from the buds. 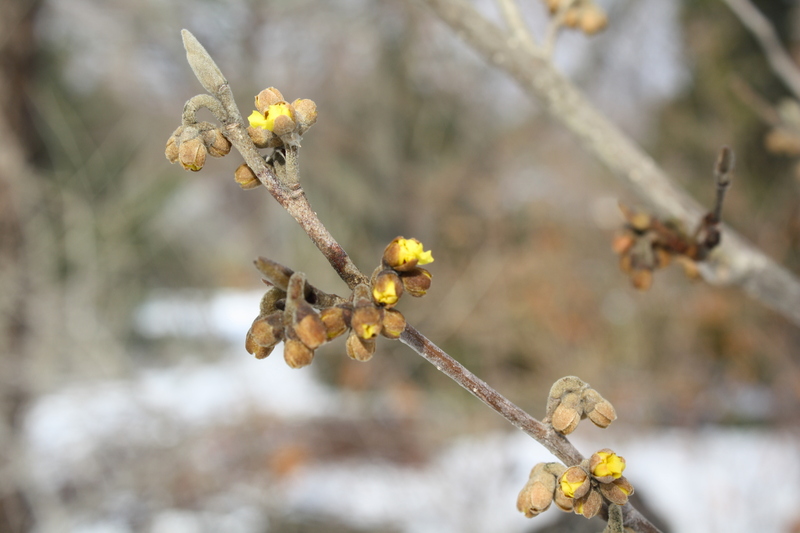 “Jelena and ‘Arnold Promise’ are both cultivars of Hamamelis x intermedia, a cross between Hamamelis mollis, the Chinese Witchhazel, and Hamamelis japonica, Japanese Witchhazel. There is also a Witchhazel native to Eastern North America: Hamamelis virginiana, which blooms in late fall. Its yellow flowers have a slight fragrance. Hamamelis vernalis is native to central North America. It begins flowering in late winter or early spring with fragrant yellow and red flowers. All the witchhazels are shrubs or small trees, growing to about 12 feet tall at the most. Although mainly the cultivars are sold and planted, they all make wonderful additions to the home landscape. I would plant them solely for the fact that they flower in winter. (It’s certainly not early spring yet!) The added bonus is that Witchhazels also have nice yellow autumn foliage and are for the most part insect and disease free. Witchhazel is also known as a medicinal plant. An extract is distilled from the twigs and used as an astringent for insect bites, poison ivy, and other skin irritations. I just found out that almost all the Witchhazel extract sold in the United States today is manufactured by one company and most of the harvest is from northwestern Connecticut. Who would have guessed! So on a “thaw” day like today (44 degrees!) take a walk and keep your eyes open for those narrow, crinkly petals suspended on bare branches. 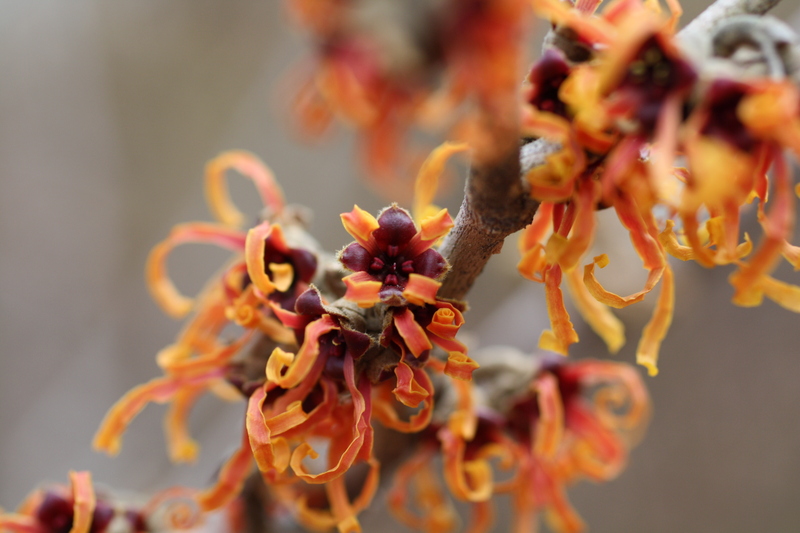 Whether it’s a native or a well-adapted cultivar, Witchhazel flowers in February lift my spirits with thoughts of spring. This entry was posted in Botanical Gardens, Garden photography, Photography, Plants, Public Gardens, Uncategorized and tagged early flowers, fall color, flowers, medicinal plants, native plants, photography on February 7, 2011 by uribg.